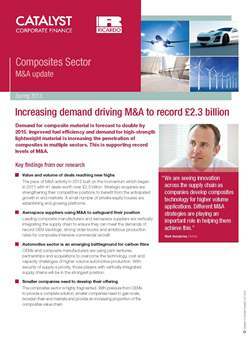 Demand for composite material is forecast to double by 2015 which is leading to record levels of mergers and acquisitions (M&A), according to a new report from Catalyst Corporate Finance and Ricardo Strategic Consulting. Improved fuel efficiency and demand for high-strength lightweight material is increasing the penetration of composites. This is particularly true of the automotive and aerospace sectors. In addition, wind energy suppliers and industrial suppliers are also increasing their use of composites. The top five producers are reacting to these changes by investing heavily in production capability, for example, Cytec is spending US$250 million annually in the medium term, to meet the demand from its aerospace customers. Strategic buyers are using acquisitions for growth and to enable them to expand into higher end markets and to gain access to new processes and technologies. A number of large acquisitions have made the headlines in the last 12 months, evidence that major producers are confident that the use of composites is set to grow significantly. An example of this strategy is the recent acquisition by TenCate of UK-based Amber Composites which enhances TenCate’s access to the European markets. Companies are also using a vertical integration strategy to protect their position in the supply chain, another feature of recent M&A activity. UK-based OEM supplier Avingtrans’ acquisition of Composites Engineering Group is a prime example of this as it enables them to gain access to the aerospace composite market and also provide integrated metal and composite components to its global customers. In the automotive sector, as the use of carbon fibre becomes increasingly important in achieving fuel economy and CO2 emissions targets, advances in production capabilities have been driven by the establishment of joint ventures between composite producers and major automakers. These include BMW’s joint venture with SGL Carbon to develop manufacturing technologies for ultra-lightweight carbon fibre for BMWs future vehicle concepts, and in the UK, JLR and Cytec have a partnership to develop cost-effective composite structures for higher-volume production. With the drive towards greater use of composites across a range of sectors, mergers and acquisitions will continue to reach record levels over the next few years, predicts the report. “The driving force behind this trend will be raw materials manufactures looking to secure component production capacity alongside OEMs who will be leveraging partnerships to access key technologies”, explained Mark Humphries, partner at Catalyst. “We also expect to see not only trade buyers active in the market, but increasing interest from private equity who will see the sector as an opportunity to develop buy and build platforms or acquire businesses to build their portfolio in the sector”, he concluded. A full copy of this press release together with the report ‘Composites Sector M&A update' is available from the links at the top right of this page.